Simple, stylish and durable. This house shaped metal key holder is a subtle conversation starter, we guarantee your customer will take notice upon arriving at their next showing for our fellow realtors. Be sure to have some handy at all times, so you can physically replace your friend, family members and possibly even your clients existing key chain with this one. They will be reminded of you, daily! The perfect compliment to keep both your personal and professional set of keys together. Be sure to include one every time you close another deal and hand your client the keys to their new home! Email us, sales@personifypro.com or give us a call anytime and let us know how we can help turn your logo / custom artwork to life! Style and taste matter! Please keep in mind, we offer much more then you see on our website. Don’t see what you’re looking for, just ask and we’ll do some searching, tailored for you and your company! 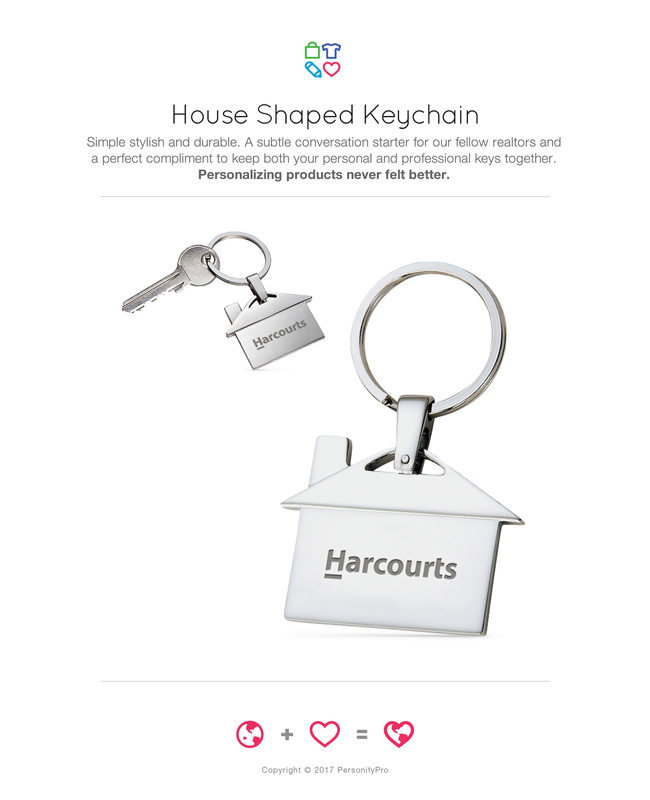 See our House Shaped Keychain, here. See all Key Chains, here. See all Home Items, here. See all New 2017 items, here. Relax and enjoy the superb comfort of our foam yoga mats. Made from high quality closed cell foam, it’s superior at absorbing shock. There’s plenty of space for you to stretch out on during your exercise or yoga session. Great for auto mechanics, too. You’ll totally enjoy the soft foam feeling and support. When you’re done, just roll it up and carry it away! This product is assembled in the U.S.A.
Email us, sales@personifypro.com or give us a call anytime and let us know how we can help turn your logo / custom artwork to life! See our Yoga Mat, here. 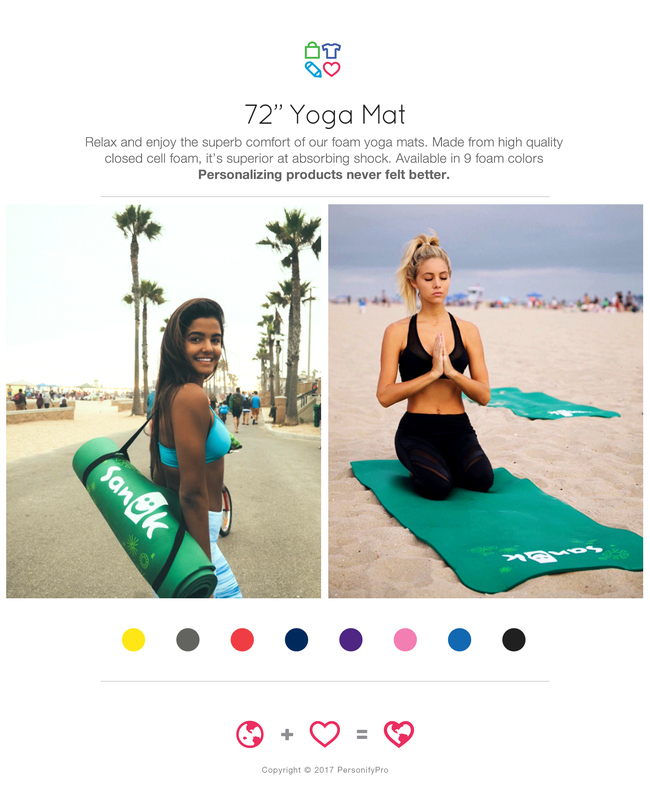 See all Yoga Items, here. See all Sporty Items, here. See all Outdoor items, here. Last minute holiday gifting / end of year branding, with this incredibly soft and relaxed pullover sweatshirt featuring a classic crew neck and long raglan sleeves. Offered in triblend sponge fleece and a poly-cotton sponge fleece fabrics. Please keep in mind we offer much more then you see on our website. Don’t see what you’re looking for, just ask and we’ll do some searching, tailored for you and your company! 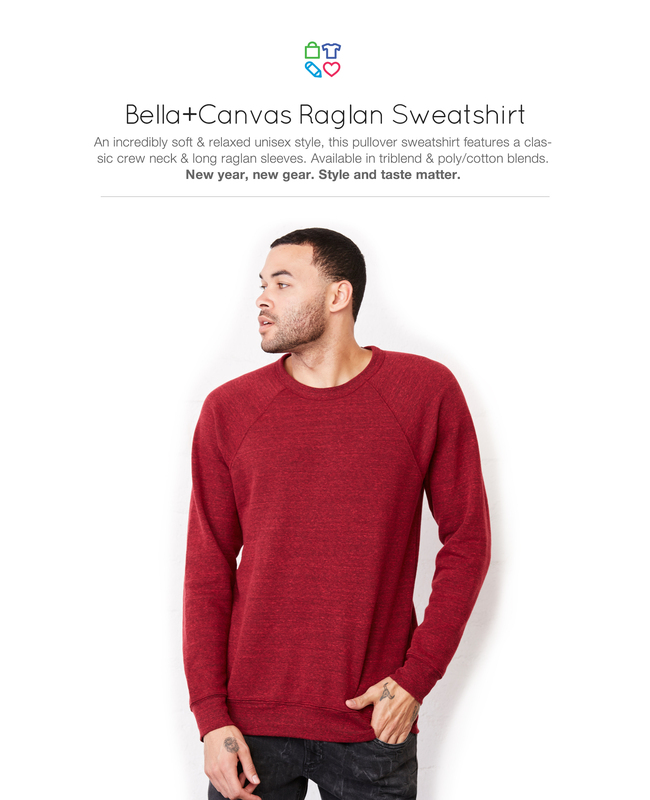 See the all Bella+Canvas, here. See all Holiday Items, here. See all New 2016 items, here. 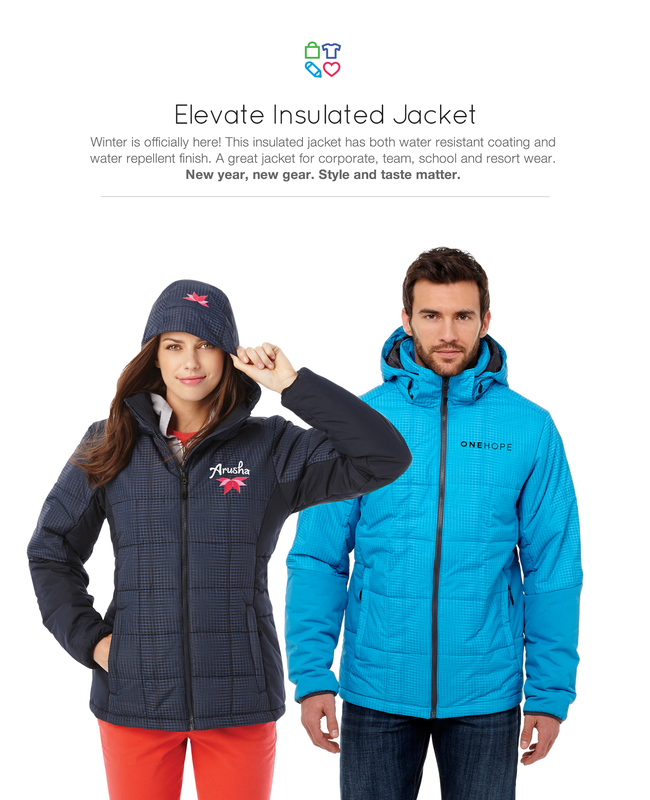 The Elevate Insulated Jacket features a graphic pattern woven with a water resistant coating and water repellent finish. The tonal pattern adds character and style in four staple colors. Turn to this jacket during extreme cold weather with its Thermaltech protection. A great jacket for corporate, team, school and resort wear. 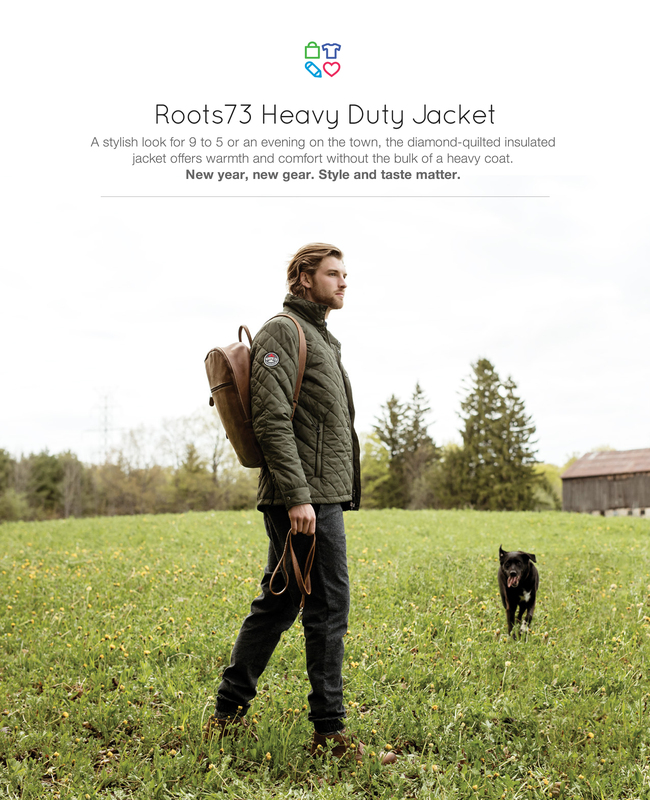 We guarantee this jacket will be remembered by helping your fellow employees; your customers, strategic partners, friends and family stay warm and stylish this holiday season. And in some cases, even the media you trust to help get the word out. We guarantee this jacket will absolutely be remembered by helping them stay warm and stylish at the same time. Summer is here! 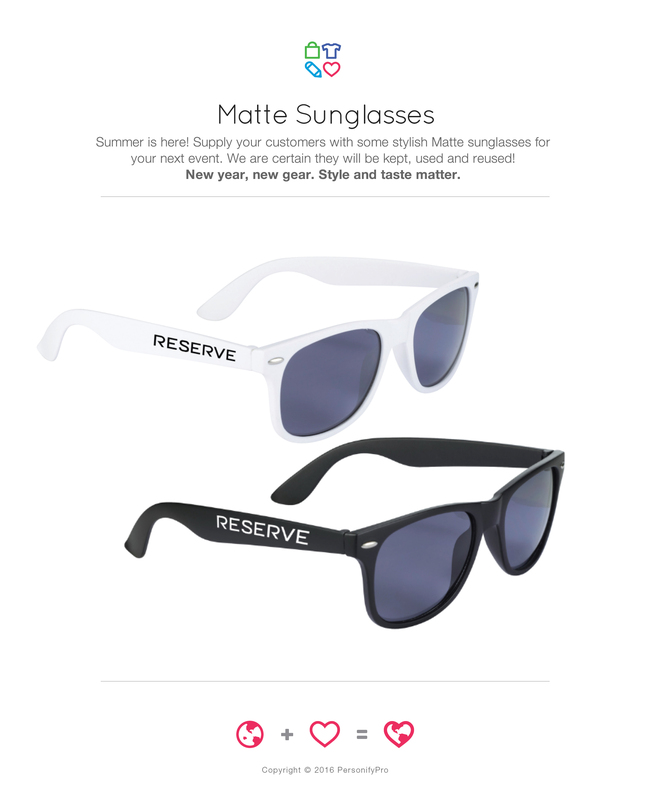 Supply your customers with some stylish Matte sunglasses for your next event. We are certain they will be kept, used and reused! Our friends and client, Reserve made great use of these, and has reordered multiple times for some of their outdoor events. If you’re not familiar with their platform to discover and book a table at the best restaurants in your area, be sure to check them out! Learn more, here. New year, new gear. Style and taste matter! Making every drink count. Effortlessly elegant. Perfect for wine tasting events, winery tours, grand openings, banquets, weddings and more. 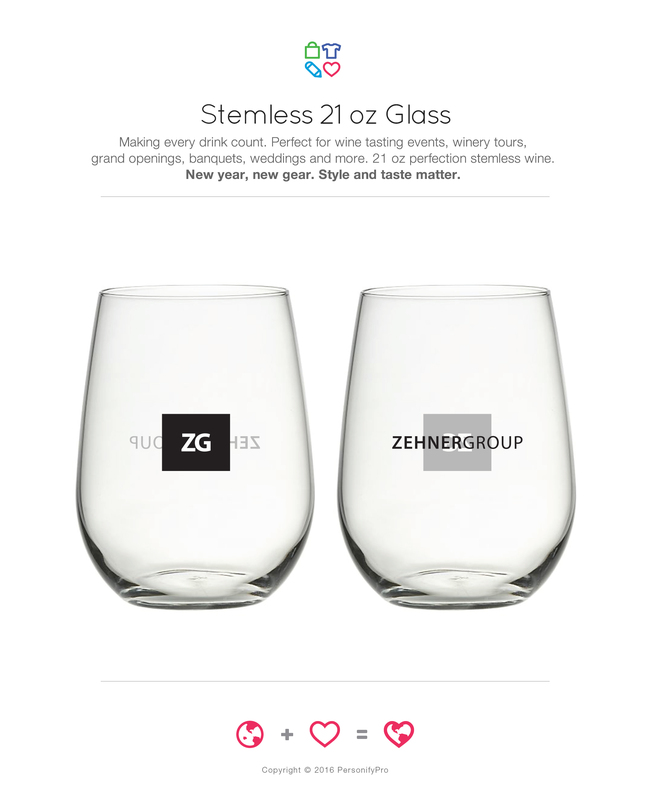 21 oz perfection stemless wine. See all Wine glasses, here. See all Drinkware items, here. Increase your connection with this personalized phone case. Made of hard plastic, this cover for your iPhone® 6 plus or 6S plus protects it from damage. Thanks to the large imprint area, your logo will have a big impact. Get right to the product, here. See more on the mobile accessories, here. See all Technology items, here. 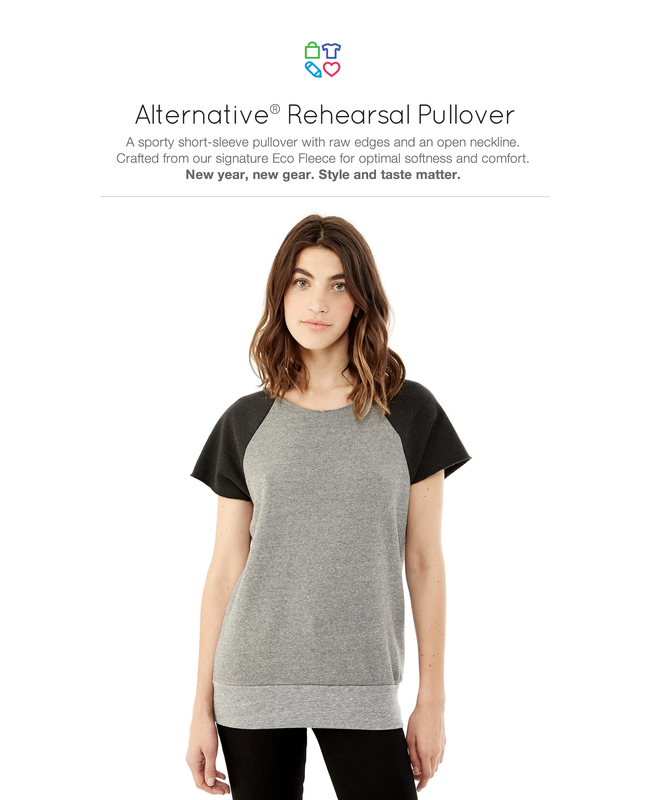 Alternative is known for their ultra soft and comfortable fabrics. A sporty short-sleeve pullover with raw edges and an open neckline. Crafted from our signature Eco Fleece for optimal softness and comfort. See all Women’s Apparel, here. Be comfortable and fashionable in this relaxed fit tee. Designed to perfectly drape over a woman’s body, this easy-to-wear V-neck tee features a luxuriously soft poly viscose fabrication, slouchy fit and short sleeves.